The mathematical model which determines acoustic wave propagation in a mixture of liquid with gas bubbles and solid particles is proposed. A system of differential equations is written and the dispersion relation is derived. Low- and high-frequency asymptotics of the phase velocity in the mixture considered are found and illustrated. The effect of solid particles and gas bubbles on acoustic wave dispersion and dissipation is indicated. 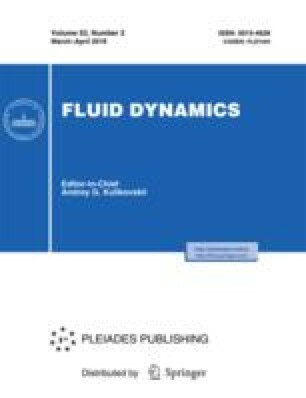 For the mixture of fluid with solid particles considered the speed of sound is compared with available experimental data. Original Russian Text © D.A. Gubaidullin, Yu.V. Fedorov, 2018, published in Izvestiya Rossiiskoi Akademii Nauk, Mekhanika Zhidkosti i Gaza, 2018, No. 2, pp. 77–83.